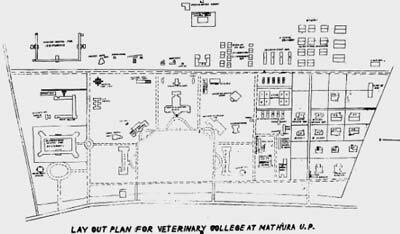 Since establishment in 1947, College of Veterinary Science and Animal Husbandry, Mathura has contributed significantly not only in terms of generation of trained human resource, but also the research contributions have been of high academic standard, which were internationally recognized. This Institution has a very glorious past. The college building of more than 50 years age is being renovated and the labs and hospital is being equipped with modern technical facilities under the able leadership of our present administrator. There are 18 teaching departments and the on the basis of successful completion of undergraduate course spread over ten semesters (including internship) degree of BVSc & AH is awarded. Post graduate and PhD programmes are research based and are available in almost all the disciplines of veterinary science.